Course Website: Official Website - Visit Osprey Meadows at Tamarack's official website by clicking on the link provided. What to Expect: While I have a hard time buying into "love at first sight" when it comes to discovering your spouse, I definitely have been a victim of Cupid's arrow after finishing my round at certain golf courses. Tracks like Cypress Point, Pebble Beach, and Shadow Creek don't count in this category because they are so well known in the golf world and you expect to fall in love with courses of that caliber. What I'm talking about is courses off the beaten path in areas like Montana, Wyoming, and in this case; Idaho. Like Circling Raven and Falcon Crest, Osprey Meadows at Tamarack was another hidden Idaho course that pierced my heart as I fell in love. So, what is there to expect at Tamarack? Expect a stunning setting with views of Lake Cascade and the privacy of towering trees. Expect a RTJ II layout with top-notch par threes and risky par fives. Expect brilliant white sand in the bunkers and a stunning setting for every hole. Expect one of the stiffest challenges the region offers while receiving first class service. Expect frustration after losing golf balls in the protected wetlands while rejoicing at the sights and sounds this special place offers. At Tamarack, expect to be "WOWed!" Signature Hole: 9th Hole – 568 Yard Par 5 – Picking out the signature hole at some courses is easy; the floating green at Coeur d'Alene Resort, the mind-blowing 16th at Cypress Point, and the much televised 18th at Pebble Beach all come to mind. At other courses it isn't near as apparent. In the end though a signature hole should epitomize the course's feel, style, and name/logo. With that in mind, the 9th hole edges out the stiff competition at the Osprey Meadows course at Tamarack Resort. For those that don't know, Tamarack gets its name from the prominent tamarack trees (a member of the pine tree family) found throughout the property. On the par five 9th a large pine tree sits in the middle of the fairway with slightly more playable room right of the trunk than left. From the tips the landing area is blind and the best play is a fade played right at the tamarack. 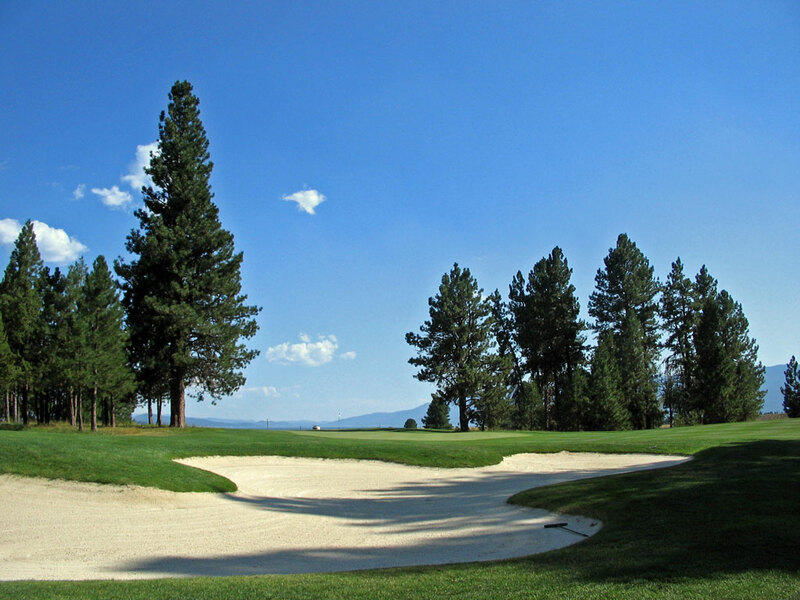 From there the player enjoys an uphill hole that finishes at a green protected by a pair of bunkers and boasts panoramic views of Lake Cascade. 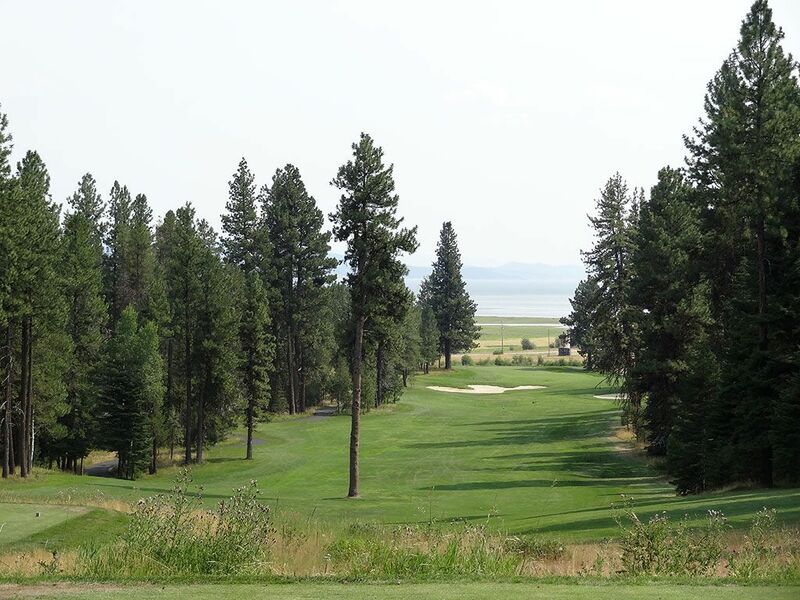 With a semi-blind tee shot, a tamarack tree in the middle of the fairway, panoramic views of Lake Cascade, and isolation from the rest of the property give the 9th hole at Tamarack the qualities it needs to be deemed the signature hole at this stunning course. Best Par 3: With five par threes on the course, there is an extra one-shotter on the round to pick from on this category. While each par three at Tamarack truly is a fantastic hole, the props go out to the downhill 3rd hole. With a pond fronting nearly the entire green, a big carry is required off the tee to a green that is protected by a bunker on the left, a bunker behind, and a forest of trees acting as a backdrop with Lake Cascade in the distance. It features trees, views, and a challenging shot; everything Tamarack epitomizes. Best Par 4: Great par fours do two things. First, they reward you for being able to shape your tee shot and secondly they require a precise approach shot to avoid the damage lurking around the green; Tamarack's 15th hole does just that. With an aiming bunker straight away, the golfer needs to shape his tee shot right-to-left in order to thread the fairway bunkers and catch the downsloping fairway for maximum distance. Next, you'll be faced with a forced carry approach shot over a wetlands arroyo to a relatively shallow green with bunkers protecting short and long. 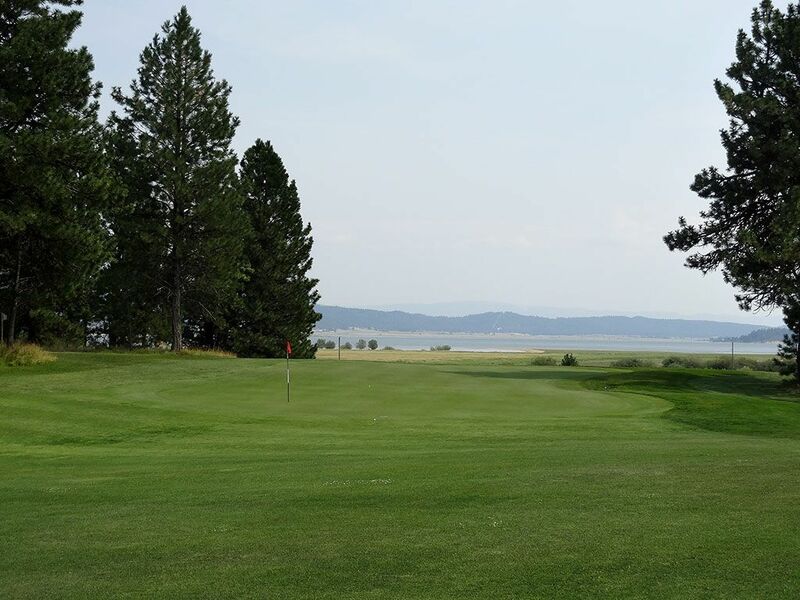 Not only does the 15th reward a shaped tee shot and require a precise tee shot, but the views of Lake Cascade and mountains in the distance doesn't hurt the hole either. Best Par 5: The 608 yard par five 4th is a great risk/reward hole. A split fairway is offered off the tee with a wetlands creek acting as the divider. A shorter, more narrow fairway is found on the right and gives you an excellent chance at getting home in two with a bold approach shot over the fly fishing pond separating the fairway from the green. The safer route is to the wide, forgiving fairway down the left side of the hole where you will eventually be left with a relatively easy pitch shot into the green. The beauty of this hole is the legitimate opportunity to cut a full stroke off this hole by taking the risk of the shorter route. A solid tee shot to the right fairway can leave you less than 200 yards to the green while the longer route to the left eliminates any chance to putting for eagle. It is listed as the number one handicap on the scorecard and is a great hole you'll want to challenge again and again. Birdie Time: While the opening downhill par five will yield it's fair share of birdies, Osprey Meadows' short 16th will render more short birdie putts than any other hole on the course. Depending on which tee box you are on and what the wind speed/direction is at the time, this can be a driveable par four. With ten bunkers protecting the inside portion of the dogleg and the line on which you'd have to take to reach the green off the tee, wisdom says to take a fairway wood or long iron off the tee to the receptive fairway before pulling out a wedge to attack this green with. The approach is downhill which assists the golfer in being able to stick it, or the opportunity exists to run the ball down the hill and nestle it up close to the hole. Whether you're going to drive the green or just play it safe, now's the time to take a stroke back from the course. Bogey Beware: As brutal as the 495 yard uphill par four 2nd hole is, how can you pass on a hole named "The Beast" as the most likely bogey on your round? "The Beast" is Tamarack's 14th hole where you will find the most intimidating tee shot of the day as you face a severe uphill climb with trees lining both sides of the fairway and a bunker resting on the inside corner of the dogleg. Your approach shot is to a long, narrow green with a bunker lining the left side and a steep hill on that right side that will kick approach shots out into the forest. Like any challenging hole, "The Beast" will gobble up any mediocre shot and make saving par extremely difficult.